Ptosis is the drooping of the eyelid. While ptosis is usually the result of aging, some people develop ptosis after eye surgery or an injury, and some children are born with the condition. This condition that may affect one or both eyes. It most commonly occurs as an acquired condition but can be congenital. When the edge of the upper eyelid falls below its normal position, it may block the upper field of vision. Common symptoms include: decreased ability to keep your eyes open, eye strain, eyebrow fatigue and headache. Many patients complain of having a “tired” appearance. 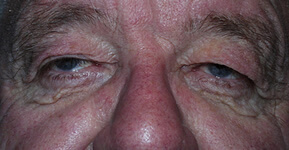 Patients may seek treatment for droopy eyelids for cosmetic and/or medical purposes. Severe drooping may obstruct vision as the eyelid gradually droops lower and lower, eventually covering the eye. If ptosis interferes with a patient’s vision, a blepharoplasty will be performed to eliminate the drooping. Many young patients with mild to moderate ptosis should be examined regularly to check for other vision problems including amblyopia, refractive errors and muscular diseases.